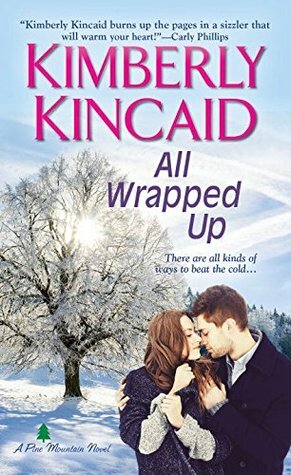 Immediately after finishing The Sugar Cookie Sweetheart Swap, I went looking for more books by Kimberly Kincaid as her novella was the one I liked the most. After a quick search on Amazon, I found that she has five Pine Mountain novels out and that the most recent one, All Wrapped Up, involved Ava Mancuso, sister to Sugar and Spice's hero, Pete Mancuso. I was intrigued by the woman Pete was afraid to hurt, who he thought wasn't strong enough to deal with their past coming out for the world to see. Plus, it is a second chance romance! Oh, yeah baby! Ava Mancuso didn't have the Norman Rockwell childhood, not with parents who preferred drinking and slinging abuse to having family dinners and sharing hugs. Her past isn't something she likes to talk about and it is the reason she ran from the love of her life seven years earlier. Now, she's a reporter for the Riverside Daily News, covering the biggest story to hit the Blue Mountains in forever. The problem? The focus of the story happens to be the same guy she ran from years ago. Nick Brennan moved to Pine Mountain two years ago, looking to escape his past. Unfortunately, his past is now his present and not just because Ava Mancuso is back in his life. No, he's been hiding in the Blue Mountains, but with one daring act everything is threatening to come out. How do you know when an author does her job? Obviously, it is when the reader worries about what is going to happen to the characters and that's exactly how I felt the moment I powered up my Kindle and said hello to the residents of Pine Mountain. This was one of those books where you know everything is going to blow up in the character's faces and you can see if from a mile away even if they don't. They were the characters that you felt for immediately and wanted things to work out from the very first page. Both Brennan and Ava were very obviously still in love with each other when they reencounter each other after so long. It wouldn't have hurt so much if they hadn't still had those feelings. For Ava, there was still some embarrassment surrounding the way she left him, but that wasn't all there way. As for Brennan, he was still angry with her for leaving without a single word, but that anger couldn't hold a candle to the attraction that still flamed between them. And boy did it flame. One of the first things I noticed about this series was that it is very much in the vein of the Lucky Harbor series by Jill Shalvis, thankfully without the social media savvy geriatric community. If there was one thing about Lucky Harbor, it was that Lucille was like an octogenarian wrecking ball, tweeting, pinning, and liking everything she could find on her phone. Pine Harbor does not seem to have a Lucille, which is surprising because so many of these small town contemporary romances seem to have at least one of those characters. The one thing that bothered me was that neither of them were really willing to open up to the other. Yeah, Ava told him about her childhood, but she didn't admit to him about how bad things were for her at her job or what she was being forced to do in order to keep it. Brennan, on the other hand, only revealed things about his life in drips and drabs, even though he knew that he could trust her not to judge him for what he saw as his failings. A big part of him didn't believe he was worthy of having a happy life and I feel like he was trying to sabotage himself. He was waiting for the other shoe to fall and when it seemed like it was about to, he convinced himself that he'd been fooling himself as to how she felt about him. I really enjoyed this second trip to Pine Mountain and am looking forward to Ms. Kincaid's new series, Rescue Squad, starting with Reckless, which is out at the end of January. In the mean time, I'm setting out to get my hands on the other four books in the Pine Mountain Series.